When we got to the airport we learned that the flight was delayed an hour because the plane was late due to weather leaving London. We checked-in, went to the British Airways lounge and waited with complimentary water, a beer and a glass of wine and really good mini sandwiches. During pre-boarding we went down to the gate to pack up the stroller, which will make you break a sweat. We thought we’d have to check the stroller into the cargo hold, but they let us take it on board and stash it in a closet. We sat on the plane for another hour because some nitwit in SeaTac’s baggage department loaded baggage from a different flight on our plane, so they had to unload our plane to take the extra baggage off. The plane was ultimately 2.5 hours late. This was the best flight I’ve ever been on! For starters, the question “Would you like some champagne, sir?” is the best thing I can hear when I’m about to take off on an airplane. 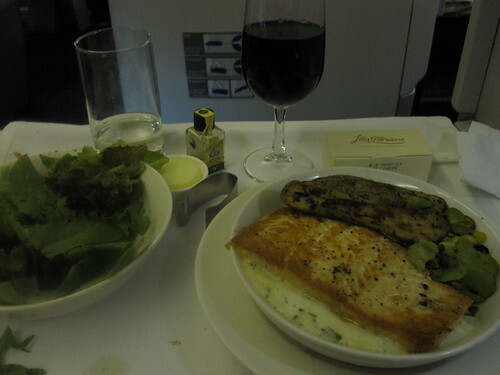 We were in Club World, BA’s business class, so we had lie-flat seats and Gay, Havana and Hudson essentially had their own little room — I was on the other side of the wall. For the first time in my life, I slept on a plane. After dinner and a really stupid movie, Bride Wars, I was tired so I made the bad flat and tried to go to sleep. I woke up and thought that I got an hour of sleep at the most, but the the pilot announced that we’d be landing in London in an hour. An hour?! I must’ve slept for 4 hours. On a plane. I never thought it’d happen. 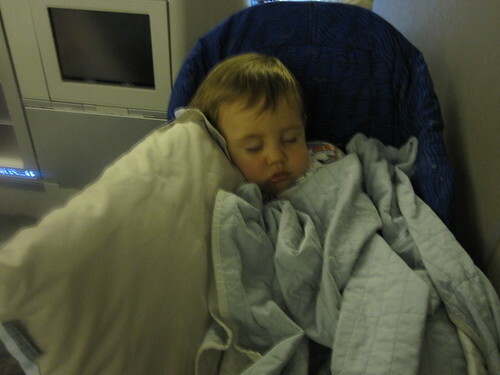 Hudson got a baby seat that mounted on a tray on the wall behind us and right after take-off, Gay put him in it and he immediately went to sleep. Havana was excited and tried really hard to stay awake, but eventually she fell asleep too and slept almost the entire flight. Before we landed, we had breakfast (cereal, fruit, yogurt and croissant) and coffee. 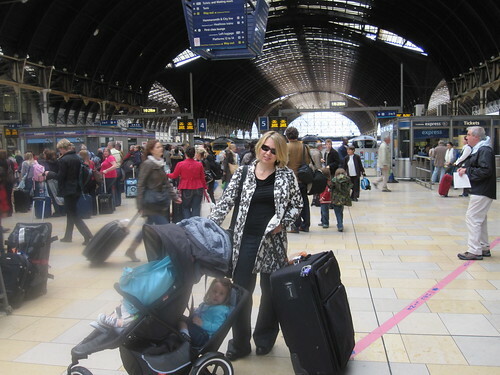 Thanks to BA letting us carry the stroller on board with us, it meant we’d have it as soon as we got off the plane and before going through customs and baggage claim allowing us to wheel the kids around the airport. Of course, Havana preferred to walk the entire way from the gate through customs, baggage claim and to the Heathrow Express terminal. Why do we have a double-stroller? We took the train to Paddington Station and took a taxi from there to our hotel in Mayfair. I’ve always loved the taxis in London but was amazed to find that we could fit the un-folded stroller, 3 suitcases, a backpack and 4 people in it comfortably inside (no trunk space). 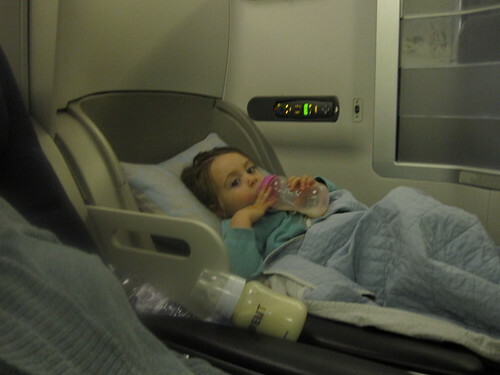 Statistics: This was Hudson’s first airplane ride and Havana’s 11th (!). Both Havana and Hudson had their first rides on a train and in a taxi. This is Hudson’s first trip outside the USA and Havana’s third. This is my 4th visit to London and Gay’s 3rd. Trading Mrs. John Smith for "tommysmommy"
Glad to hear you arrived safely. Sounds like Havana and Hudson did very well. But, then, traveling is old hat to Havana, and no doubt Hudson will follow suit. In spite of the delay in taking off, looks like everything else went smoothly. Gay and the kids look great! Enjoy and we’ll be checking in every day. Glad to hear that you are off on another adventure – Great way to fly. Havana & Hudson are so adorable! Gay have fun training for the Marathon. Lots of room in Hyde park to practice. I saw that you enjoyed running across the Golden Gate Bridge – Hey I walked across the Lions gate bridge (almost a twin bridge) in 1938 the day it opened.